Keep up-to-date with all the latest video game releases! Kidzworld has all the latest games to keep watch for. This week, we preview Xbox 360 Kinect, Kinect Games, and Tony Hawk Shred! 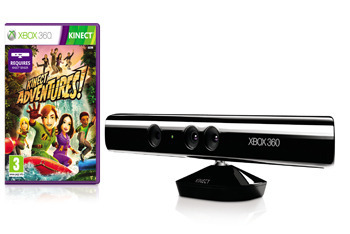 The Kinect is the Xbox 360's new motion controller, which unlike the Playstation 3 and Wii, does not require any actual controller at all! The Kinect just sits next to your TV and tracks your movements in front of it for every Kinect game, tracking your movements in amazing detail for gameplay. You can even give the Xbox directions simply with your voice, telling it to play a movie or giving the name of your new Kinectimals pet. Kinect comes with one game, Kinect Adventures, and there's a pretty sizeable launch lineup of other games worth checking out as well. Kinect's getting a ton of games right at launch, so let's go over as many as we can. 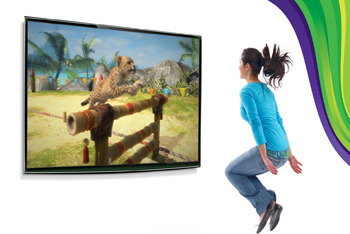 Kinectimals lets you keep a wild cat as an adorable pet you can play with. Kinect Adventures gives you a bunch of different adventurous challenges to conquer, from river rafting to a mine cart obstacle course. Joy Ride lets you race with your Xbox Live Avatar with big stunts and jumps. Kinect Sports lets you motion-control your way through bowling, boxing, track and field, ping pong, soccer, and volleyball. Dance Central lets you show off your moves to the beat of a killer soundtrack. The sequel to Robomodo's board peripheral skating game Tony Hawk Ride is called Tony Hawk Shred, and this time around you can snowboard too! Travel around the world from Hawaii to Greece to Beijing skating and snowboarding your way through each level. There are several difficulty levels depending on how much you want to control your steering on the wireless board controller. And the game characters cross the gap from old to new school with Tony Hawk and Geoff Rowley combined with Travis Rice and Chaz Ortiz, to give a few examples.